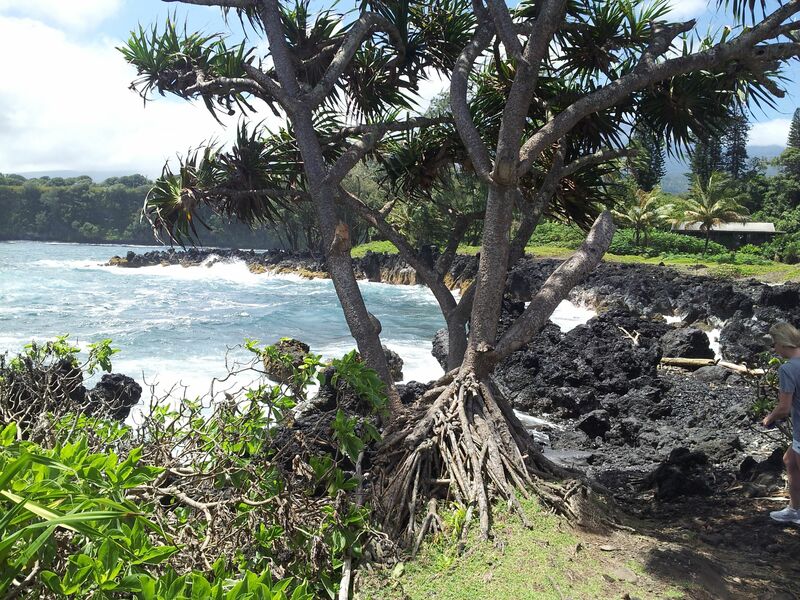 The beautiful Keanae Peninsula on the way to Hana…not to be missed! The Road to Hana is not something to be survived, but something to be savored and enjoyed! I’ve spoken to countless people who’ve done the mythical “Road to Hana” and thought it was beautiful, but probably would never consider doing it again. How unfortunate. The vast majority of people do the Road to Hana as an all day “death march”. Neither my wife nor I wanted to spend the whole day in the car, so when we finally went to Hana on our most recent visit to Maui, we decided to spend a few nights in Hana. I highly recommend this strategy…it will change the whole complexion of the trip and turn it from something to “be survived” to something to “be savored”. I also encourage you to read up on a guide book and get an idea of the waterfalls you’d like to see, but please don’t stress yourself out thinking you have to see every single dribble of water along the way. Pick a few that sound interesting and enjoy the drive. Stop when and where you feel like it. This is Maui! DO take the short side trip to the Keanae Peninsula. It is an absolutely beautiful location, and if you haven’t yet taken my advice to relax, this is a great place for an attitude adjustment! Aunty Sandy serves some wicked good banana bread to put you in the right Maui state of mind. 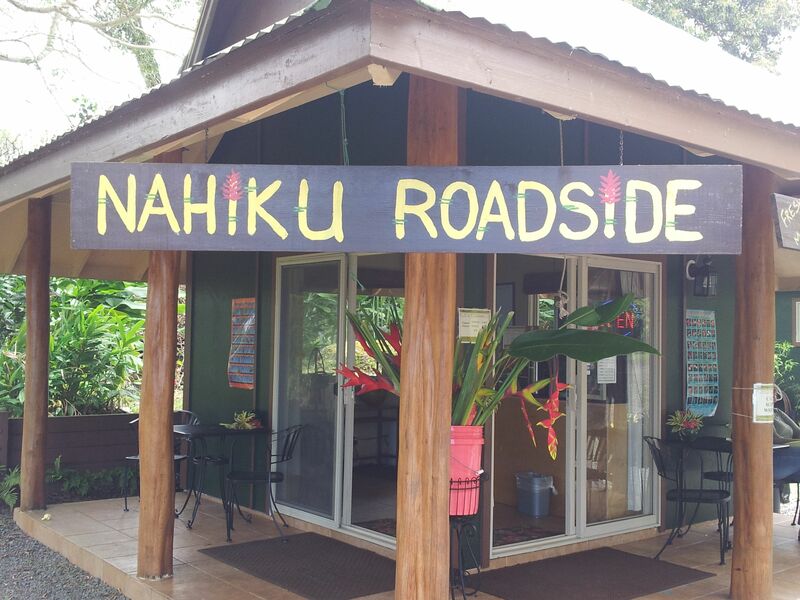 DO stop at the Nahiku Roadside cafe (along the main highway, not the Nahiku turnoff) for a coffee and snack. Friendly staff, interesting flora, and even a nice view of the ocean. Update 12/17/13: appears to be closed. We hope they reopen! Update 12/17/13: Check out Coconut Glen’s, about 15 minutes before you get to Hana. Their coconut milk-based ice cream is really, really good! The town of Hana itself is very sleepy. I think this is part of its charm and draw…if you think Maui is relaxing, just wait until you experience Hana! To enjoy it you should plan to spend at least a couple of nights there. Not doing the Road to Hana all in one day means that you can get a good night’s sleep and then take a leisurely drive to the Seven Sacred Pools the next day. In my opinion, this is the most interesting part of the drive…the road narrows, the mystery increases, and because you are rested you can actually enjoy the drive! This also means you get to have the place to yourself before all of the Road to Hana day-trippers arrive around 12:30 and later. 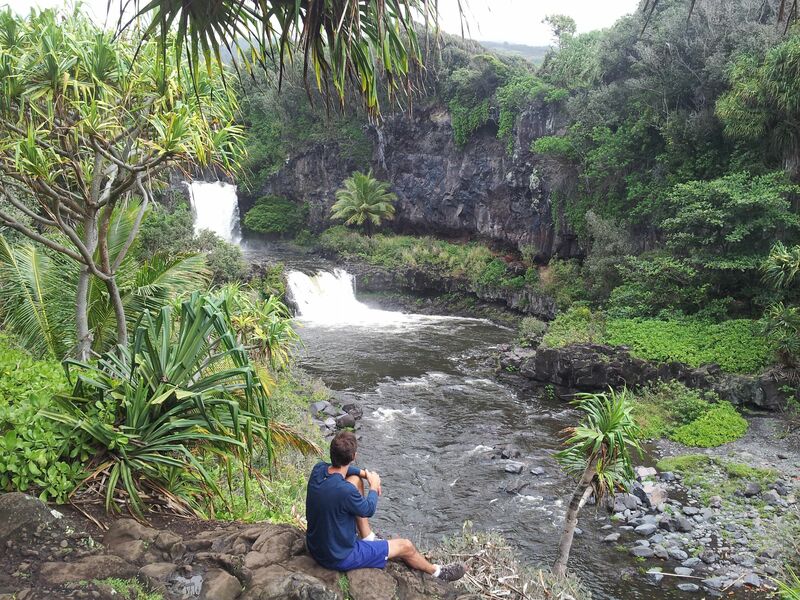 Enjoy Maui and the Road to Hana! This entry was posted in Uncategorized and tagged Hana, Hawaii, Maui by davekresta. Bookmark the permalink. For those that can spend a couple days in Hana, it’s a great way to spend a vacation. For most who have to go through it in a day. They definitely don’t get the most complete picture of the beauty and tranquiliity of the land. We try to spend as much time in Hana on our days off as there is so much to appreciate. I personally love hiking around Kipahulu. For those who can spend a few days in Hana, it really is something. Of course is everyone tries to spend a few days there then it would dramatically change the region. Having lots of day visitors can keep the infrastructure small thus preserving the peace. The full peace and tranquility that residents here feel can really be felt first thing in the morning. We try to spend as much time there as possible on our days off. I love hiking around Kipahulu.